This is by far the most expensive electric toothbrush on the North American market. It has a variety of useful features. But, it also has quite a few features that are simply meant to raise the price. 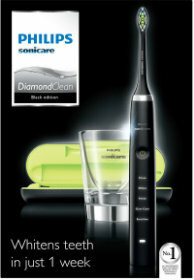 The Sonicare DiamondClean from Phillips is their range-topping toothbrush available to purchase today. It is often considered the Lamborghini of electric powered brushes. 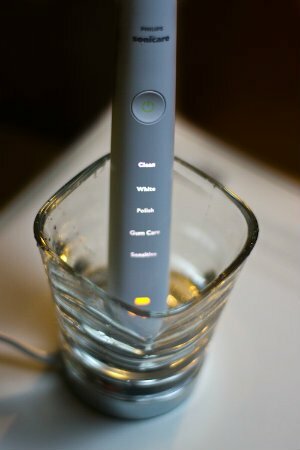 Even though this might sound like an exaggeration, DimonadClean is one slick and well-designed toothbrush. Considering the high price of this model, it does not really compare to anything else but Oral-B’s Pro 7000 and 8000 series. The Sonicare DiamondClean is considered to be a luxury option for an electric toothbrush. It has a more defined look, meaning it wouldn’t look out of place next to your Chanel hand cream. 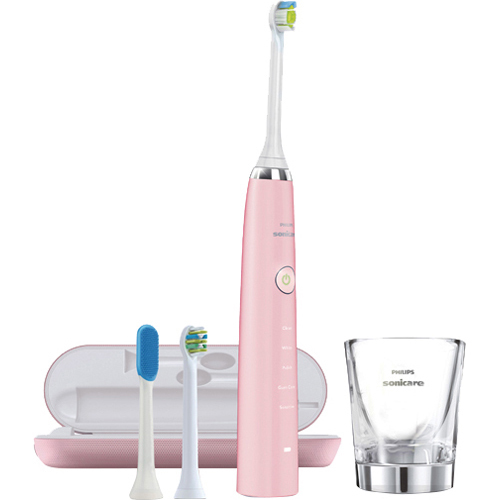 In addition, this Sonicare model comes in 4 different colors: white, black, pink and amethyst. So, no matter what kind of weird bathroom design you are into, I guarantee this toothbrush will fit well on your sink counter. In another post, we described DiamondClean as the tuxedo, or the elegant dress you would wear to a red carpet gala event. And, we will stick by this description. As this is the most sophisticated and non-futuristic looking motor-powered toothbrush on the market right now. Is this a good thing? We think so, yes. READ MORE: Not convinced that this is the right brand and model for you? Check out our extensive comparison list of the best electric toothbrush models on the market today. If you are short on time, here is a quick review of the good and the bad. USB charging can be done with the travel case. Overall a great cleaning performance. Fully sealed handle body to prevent the build-up of bacteria. Only a single brush head included when purchased, replacement brush heads are rather on the expensive side. Glass charger isn’t easy to use and can easily be broken. When we first opened the package, we were amazed at how simple yet elegant and sleek the DiamondClean looks. This is the closest competitor to Foreo’s ISSA model in terms of good looks. There are no bumps, no rubber strips and not unnecessary buttons on the handle. Instead, the entire handle is made of a smooth non-slip material. It makes it very easy to hold and operated whether your hands are dry or wet. There is just one button on the handle, and that’s the power button. It turns the brush on and off, as well as allows the user to shift through 5 different brushing modes. 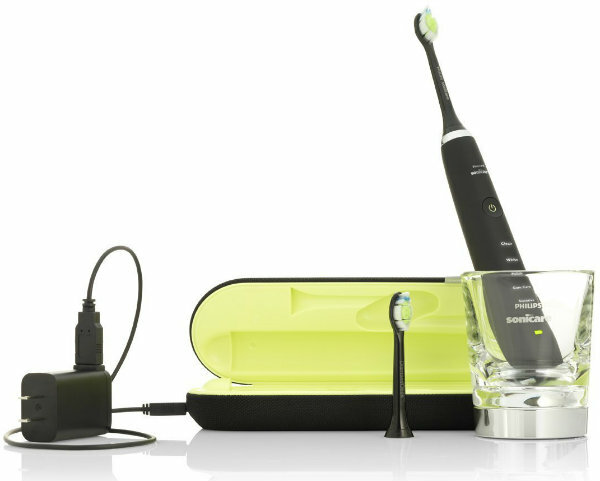 Like the majority of Sonicare models, this one comes with a powerful Lithium-Ion battery. It takes around 16 hours to fully charge, and then it can be used for 14 days or so. Depending on your personal usage habits. As you would expect for the price, this toothbrush is packed full of features. My favorite one is the glass charger. It is simple, innovative, and useful. What’s not to like? In order to charge your toothbrush, you just need to drop it into the glass. It is wireless charging. However, the glass charger itself has a conduction base. This means that the glass has to be placed on top of the base first. Electricity does have to come from somewhere. After all, this is not dark magic. Although this is not the only way to charge the toothbrush. There is a USB mini-B socket which will allow for it to be charged whilst inside it. Washing the glass is fairly easy. You can either rinse it or throw it in the dishwasher. There are 5 color options available, these are: white, black, rose gold, Amethyst, and pink. Phillips has really targeted every demographic with these options. The stylish design means that they will fit in well into any bathroom. The travel case which comes with this toothbrush is textured. It is bright green on the inside and shiny silver on the outside. It looks pretty cool. It also has a USB charging port, so you can charge the actual case. It is great because you do not need to carry around a case and a charger at all times. The travel case can fit in the toothbrush and two brush heads. Regrettably, this case comes with no air vents. We highly recommend you dry your brush heads before you place them back inside. This is an extra precaution in order to avoid mold formation. Also, because the travel case is textured, this can lead to dirt and grime being built upon it. When it comes to the price, you are mainly paying for the design, and the amazing sonic brush performance. Philips has managed to cheap out again, by offering only 2 brush heads even with their most expensive model. The brush head replacements for the DiamondClean are twice as expensive compared to Oral-B’s. The positive is that this toothbrush contains a lithium-ion battery which will allow for longer usage, with many people quoting that it lasted up to 60 brushes without the need for charging. The Sonicare DiamondClean will deliver the promised 31,000 brush strokes per minute. The result is that you receive a consistently good clean without exerting too much pressure. It is possible to lightly press on both your gums and teeth making sure that you move it on after a few seconds. Clean – All Sonicare models come with this standard cleaning mode. This is what most people end up using in the long run, despite having 4 more options. White – This mode is supposed to enhance the whitening of your teeth. At Dental Dorks, we are not firm believers of such features found in electric toothbrushes. What this mode does is simply alternating between the standard and pulsating vibrations of the brush. Polish – No, it does not polish your teeth. Weird, I know. This is a higher powered brushing mode that is supposed to aid in the elimination of stubborn plaque. Gum Care – This is a 3-minute cleaning mode. The first two minutes the brush is vibrating at its highest speed, offering a solid clean. The last minute, the speed slightly drops in order to offer gum massage. Sensitive – This is perhaps the most useful mode, besides the original clean one. The sensitive brushing mode is great for people who experience painful gums. The DiamondClean comes with a memory feature which remembers the last brushing mode you have used. So, the next time you turn the brush on, it will automatically go into that mode. Hate it or love it, this feature is included. It is a basic feature that turns the brush off after 2 minutes. It also vibrates every 30 seconds to remind you to move the brush to a different zone in your mind. It is featured on almost all electric toothbrushes. It is not revolutionary by all means. When the brush stops, all you have to do is press the start button again. It is not as annoying as some people describe it to be in various reviews. I mean, yes, the brush stops for a second, and yes, it does take the effort of your thumb to press the start button again. This is, of course, in case you do not feel your teeth are as clean after 2 minutes. This is a lovely feature that a lot of brushes do not have. It makes the transitioning from a manual to an electric toothbrush a breeze. First-time users of sonic toothbrushes will feel awkward when the brush starts moving at 31,000 brush movements per minute. Your gums will feel ticklish and awkward at first. This is unavoidable due to the sonic technology. EasyStart helps reduce the ticklish effect by slowly increasing the speed of the brush over the first 14 uses. It is a good feature to have. Especially if you have a child and you are trying to adjust them to using a Sonicare toothbrush. The experience we had whilst brushing with the DiamondClean was consistent with most of the higher end toothbrushes available on the market. 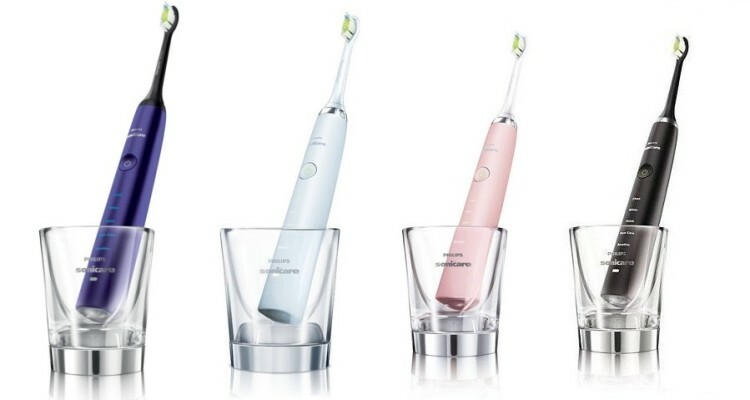 With a vibration of 250Hz, the movement of the Sonicare won’t be visible to the naked eye but will give a great clean. Like most Sonicare models, this one does not require much effort in terms of applying pressure. The brush basically does everything by itself. You just need to point the brush head in the right direction. With the long vibration giving you a prompt to move the brush to another section at 30-second intervals, this brush really helps you to get a consistently good clean every time. This helps to eliminate the need to count in your head each time and it will become a natural thing after several uses. Looking closer at the glass charger which is supplied, we found it to be cumbersome to use. After a few weeks, we found that it had built up a lot of toothpaste and drool. However, with a quick wash in the dishwasher, it was back to looking brand new. It does seem like a novel idea and should be handled with care. If the glass breaks you will have to use the small plastic charging station or the travel case to charge your toothbrush in the future. #### No, there is a plastic stand included if not using the included glass. Does anyone have experience with the pressure sensor feature on Sonicare toothbrushes? I just got the new Sonicare Protective Clean 6100. One has to exert an unrealistic amount of pressure to make the vibration change pressure sensor activate. Philips online chat rep said that the pressure sensors in their toothbrushes all have the same sensitivity. I did read another review that made the same comment about the sensor. Just wondered if I’m on target here, or if maybe the toothbrush I have is not working the same way others do. Thank you.